As you might have guessed by the hotel name, the golf course at Hellidon Lakes is renowned for its water features. This makes the course a challenge for even the most competent golfer, so play it safe or run the risk of the water hazards – the choice is yours! We have 6187 yards of championship golf over 18 holes (par 72) plus the additional valley 9 hole course to complete the 27 hole experience. We also have two putting greens and practice ground to take advantage of before you attempt the course.The course is set in 220 acres with 8 stunning lakes, with undulating fairways, finishing with a gem of a par 3 over water to a target green. 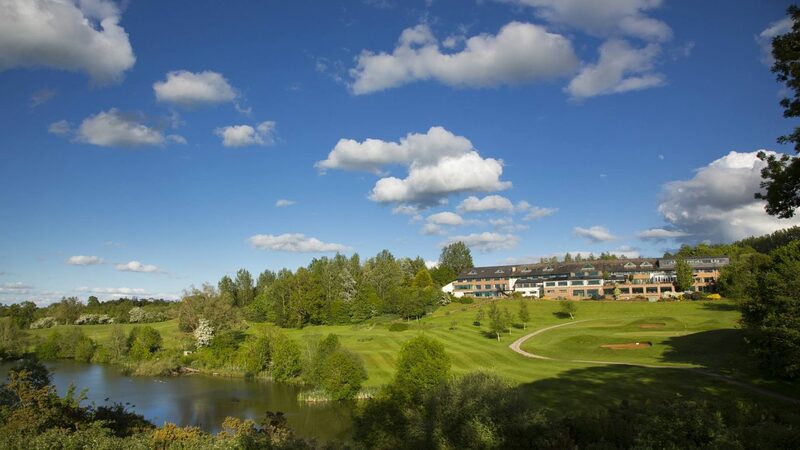 With the excellent facilities including Leisure Club, Spa and 106 spacious bedrooms, Hellidon Lakes is the perfect choice for not only a society or corporate golf day but also a golf break with friends or colleagues. Our professional golf planners will work closely with you to design and manage a unique golf break or corporate golf event with every detail considered, from the moment your guests arrive. Our retail golf brochure can make every single item of your day bespoke to your needs with custom logo and imagery as required. QHotels aim to design bespoke golf days for your society, golf group or business. Our packages range from £19-£47pp. Follow post code NN11 6GG, we are only 20 mins from M1. £15-£30pp. You can book tee times via our website. Driving Range, Pitching Area, and Putting Green. Fleet of 20 buggies.